Sunday School Lofts is a boutique 32-unit loft development located within a residential neighbourhood in Riverdale. 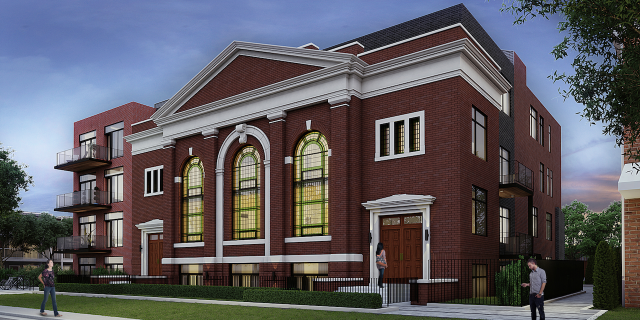 The intimate 4-storey building will incorporate an existing 1925 Temple Baptist Church facade, windows, doors and north and south return details. The project will be comprised mainly of 2-3 bedroom suites (27 of 32 units) and the average size in the building will be over 1,000 square feet. There will be eight penthouse units, seven of which will be two-storey units with both main floor terraces and roof terraces. All units will come equipped with generous kitchens, quartz countertops, eight foot high interior doors, gracious master bedrooms with ensuites and engineered hardwood throughout. Gas hookup's for BBQ's will be included on all balconies.